ABQ Free Press is devoted to analysis, interpretation and explanatory journalism on topics affecting the lives of people in Albuquerque and across New Mexico. A significant portion of our effort is devoted to uncovering what the state’s other media overlook. People drive our news agenda. Our motivation is public service, not corporate profit, and when the community speaks, we listen. Telling in-depth stories of people who represent our diversity and challenging power in a way that informs and empowers people and communities. New Mexico Mercury aims to feature perspectives and analysis from New Mexico’s extraordinary community of thinkers, writers and subject matter experts on the major issues facing our state and region. New Mexico Political Report is a non-profit news organization focused on promoting a greater public understanding of politics and policy in the state of New Mexico. 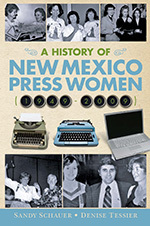 New Mexico Press Association is an organization representing the interests of newspapers throughout New Mexico.